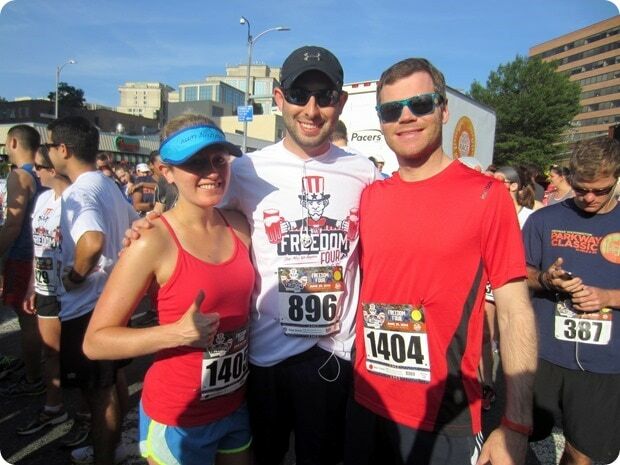 On Sunday morning, Matt, our friend Steve, and I all ran the Freedom Four Miler put on by Pacers running store! 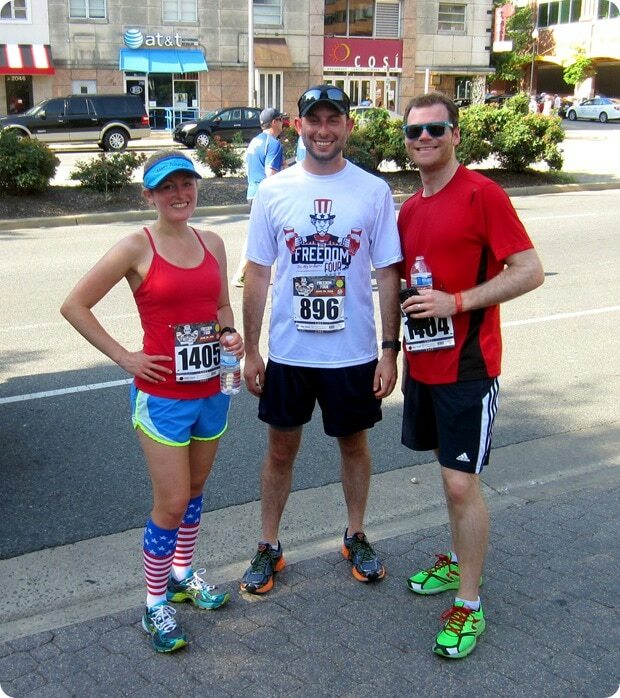 Clearly I used the occasion as an opportunity to bust out my American flag compression socks, which were a gift from Running Skirts at the Runner’s World Heartbreak Hill Half & Festival last month. 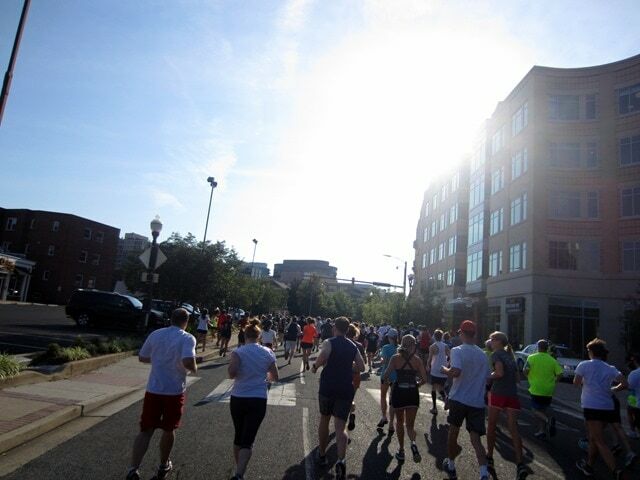 The Freedom Four Miler started and ended at Ireland’s Four Courts in Arlington, VA. 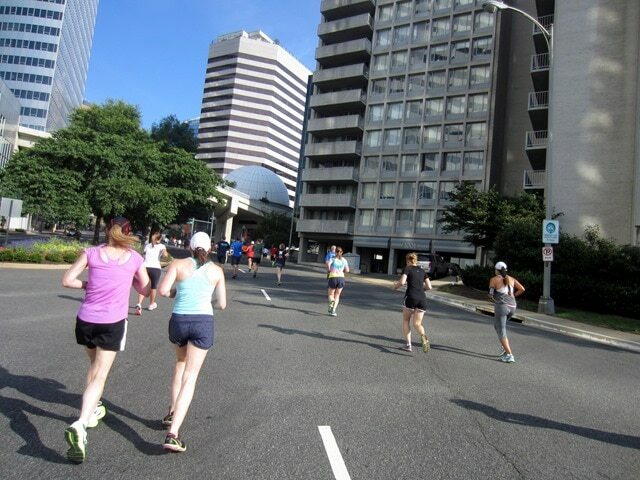 It was awesome doing a smaller “local” race vs. the huge downtown DC races I’m used to. We left our place at 7:30 and had time to stroll over to Four Courts to pick up our packets, put on our bibs, and meet up with Steve before heading to the starting line for the 8 a.m. push off. Easy! 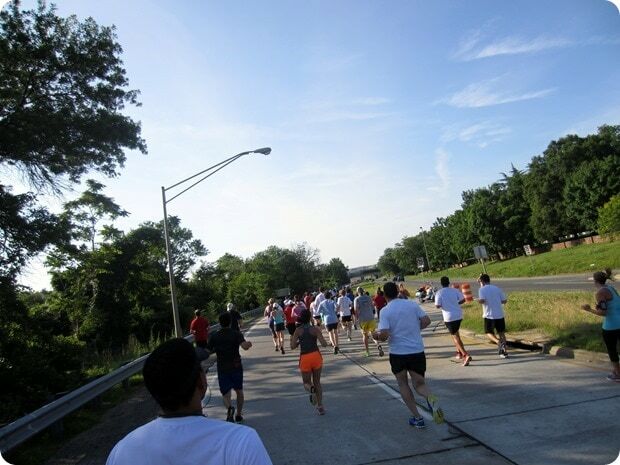 After the nice downhill, we ran about a mile out on the highway. Not too thrilling but nice and flat for the most part. Matt took off ahead and Steve and I ended up settling in to run together. It was an out and back so it was fun to see the winners whizz by the other way, looking strong! Aaaand back we go! It was a beautiful morning, but pretty warm in the sun. Whew! There was a bit of a flat area for us to catch our breath and then we started up the final steep incline to the finish line. This wasn’t as bad as the first one since we knew the finish line was almost there! Go team! Official results: Matt finished in 33:04 (8:16 min/mile pace) and Steve and I finished in 35:39 (8:55 min/mile pace). I’ll take it! Once we were done running, we got down to the important matter of the day: brunch. Involving donuts, clearly. 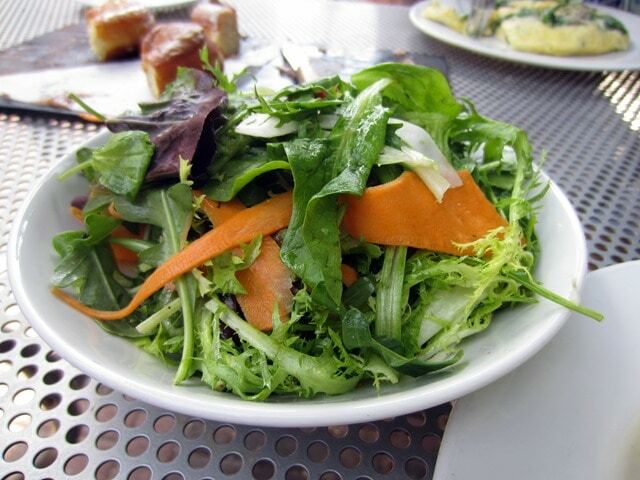 We hit up Lyon Hall in Clarendon for brunch – I’d only been there for dinner before so it was fun to mix it up! Their brunch was awesome, too. The donuts we shared to start were delicious, and for my main course I got the mushroom/bacon/spinach omelette, which was more like a frittata. Pretty! I also got a side salad, which I ended up saving for later (I saved half the frittata for later, too – it was huge). 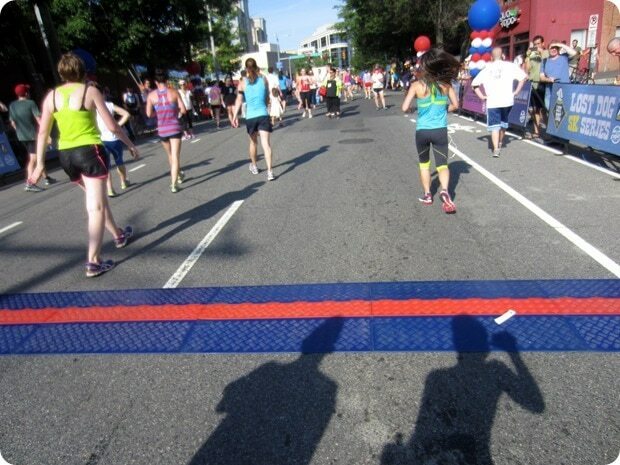 Which do you prefer: big city races or smaller local ones? I like both – big races are obviously awesome for crowd support, but small ones are nice logistically! I love smaller races as well as they are well organized! Loving your socks. I was wondering if they help with muscles/shin splints? Or are they just for fun? 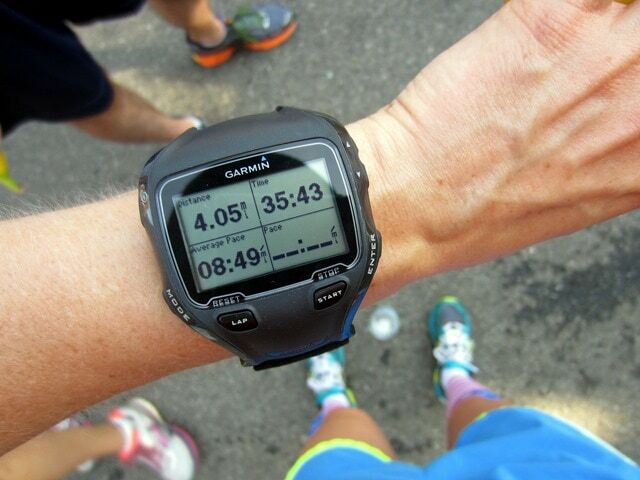 I ran a 4.4 mile race at a similar pace a few weeks ago and was darn proud of the finish time! It’s getting far to hot to be trying to run for pace now. Those flag socks are awesome! I love them!!! Small races are so fun and relaxed. Makes for a fun atmosphere. 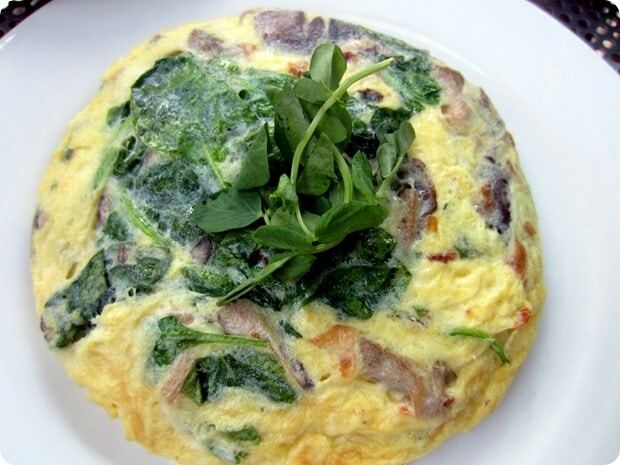 That omelette looks sooo good, but really big too. Nice job! I also ran that race and loved it. The uphill finish was rough though! I did that same race around St. Patrick’s Day last year TOTALLY on accident- Fabio and I had set out for a 4 mile run and we noticed Wilson Blvd. was closed and packed with runners. We wound up asking someone what race and it was and they told us it was the Arlington four miler and it had (luckily for us) just started. Since we had to run that distance anyway we wound up doing the race with everyone and then just turning off at our apartment before the finish line. It was so weird/awesome/illegal? Haha! Those doughnuts look yummy!!! I like both races. The momentum I get from a big race is great but I like the low stress of a small race. I like both small and big races. If they’re local, I love that I can drive to the races and not worry about getting up waaaay too early. 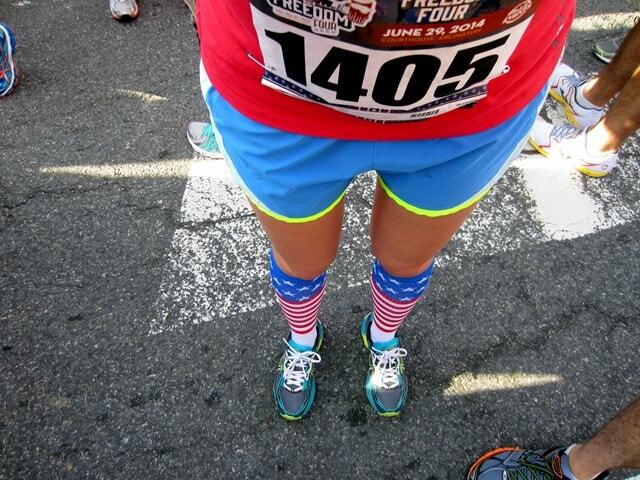 Reading about all your races is giving me the itch to register for a half marathon or something very soon! Way to go, seriously! I love big races – especially in San Francisco. 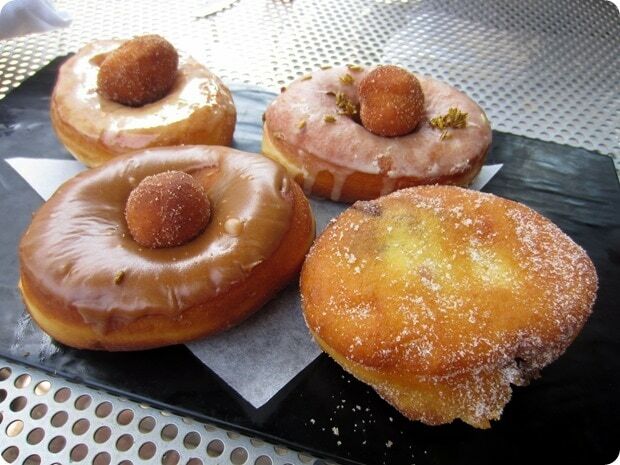 Those donuts are beyond amazing-looking. Donuts are my #1 weakness. Looks like great fun. There is nothing like local races. And well done to Matt. Time for him to break 8-min miles! Love the outfit!!! Well done! I don’t do much running but I do talk to myself going up hills…I just think how I push through tough resistance in spin class and will my legs to fight! Congrats on an awesome race! Those socks are awesome :) And that omlette/frittata looks amazing! I personally love smaller races the most…but I’m doing Chicago this fall and can’t wait, so big races have appeal too. I like smaller races because the larger ones freak me out. I don’t love races in the first place bc I’m more of a running for fun kind of person, but the races I have done have been pretty small and I enjoy not getting lost in the crowd. The camaraderie is always good too. Looks like you had a good time!! I usually prefer smaller races but every now and then it’s fun to run a giant race. They have so much hype and excitement! Congrats on the finish! I like both small and large races, too. And donuts are a fun way to finish the race! Congrats on the race! Running in July is no joke. :-) I like both, too. 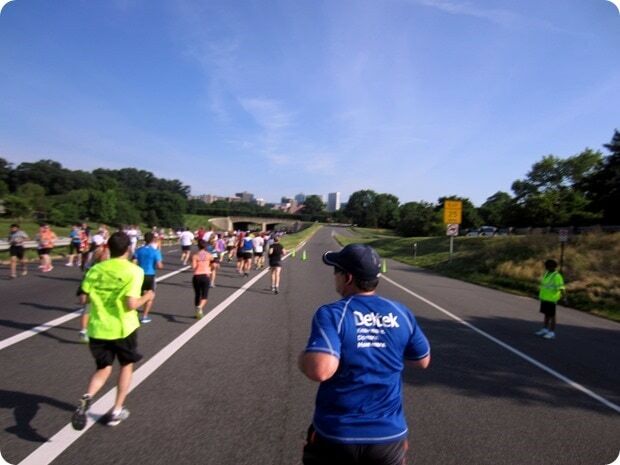 Big races are ideal for half or full marathons so there’s someone out there with you on the whole course (and spectators! ), but I prefer small 5ks and 10ks.